My Aunty Pat has just arrived from the UK so I went to the airport to pick her up. This involved – Vacuuming out the car, driving the clothes in the boot (trunk) to the charity shop then washing the car all before 9:30am when she was due to land. Aunty Pat is staying at my other Aunts place. I’m going to be hosting her daughter (my cousin Claire) in two weeks time – the poor girl will be sleeping on our couch. Dad is also due to arrive from Adelaide on Easter Saturday. Yesterday Joel and I had a festival of consumerism (that’s what he called it). We went to our local shopping centre and let loose. We bought a colour laser printer, some DVDs (Harry P and the Goblet of Fire, Stargate SG1 season II – just watched season 1) a new receiver unit for the stereo with more imputs so that we no longer have to swap the imputs around at the back when we want to listen to our mp3s (iPods) or watch DVDs (I know it sounds lazy but it was a major hassle). These items have been on our wish list for a while so it was fun to do it all in one big shopping trip. I’ve also managed to put a few stitches into Japanese Octagon box so here is a WIP picture. There are two panels out lined because I finished stitching the black outline of the second panel pictured then remembered it was an octagonal box and would be 8 panels not 6 – I thought Cindy had been generous with the fabric!! 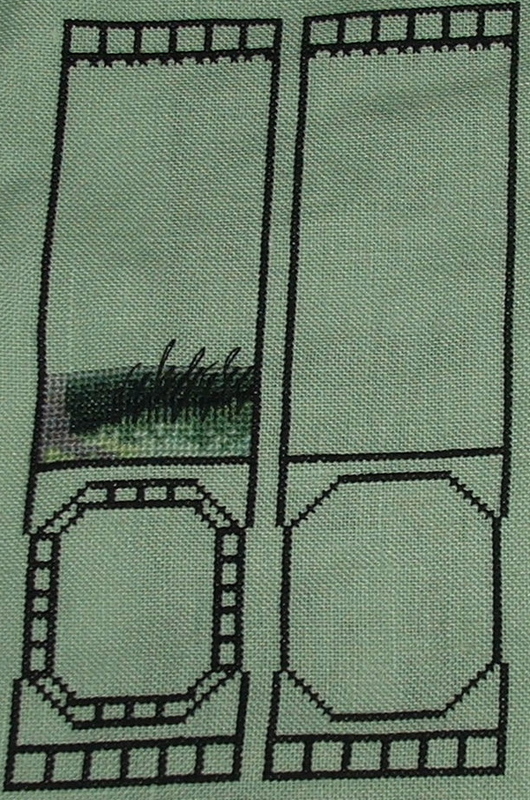 I’m going to be picking up Grape Threadkeeper again- this month we add in the grapes which are queens stitches. I’m treating it as a priority as this group finishes first.